The Kelpies are two 30 metre steel sculptures of horse heads that stand in a custom-built extension of the Forth and Clyde canal near Falkirk. These huge artworks are clearly visible from the motorway that runs alongside them – which is hardly surprising as they’re officially the largest equine sculptures in the world. Both heads can be walked around and there are so many photo opportunities here that you won’t really know where to begin. You can even go inside the heads to marvel at the complexity of the construction work before heading over to the visitor centre for lunch in the cafe. 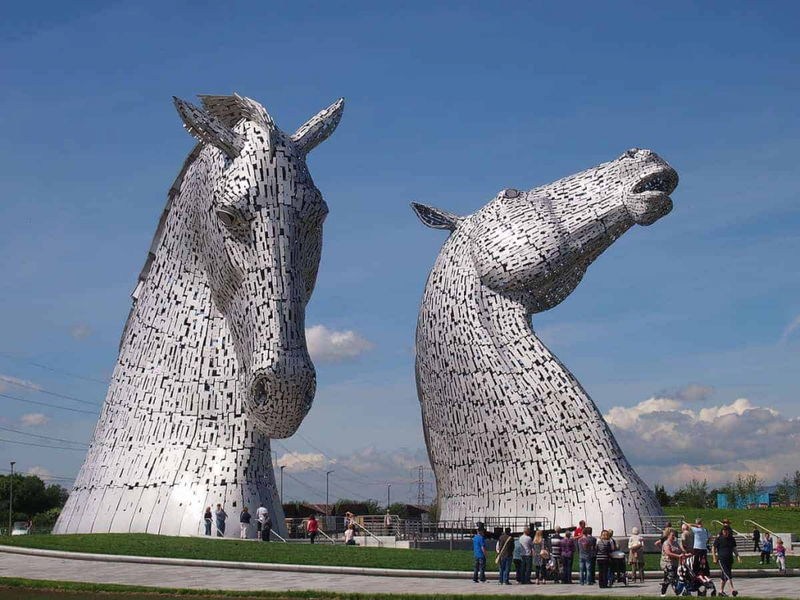 Although The Kelpies aren’t going to keep you busy all day – more like an hour – they can be combined with a visit to the nearby Helix Park to easily last a full afternoon, and because Stirling is nearby you can easily add them onto a visit to the city too. There’s a 30 minute guided tour that explains the history of the sculptures, how they were manufactured, and the significance that horses had to the industrial development of the region over the course of a hundred years. The canals around the site are perfect for walks with the nearby Helix being particularly popular with tourists and locals alike. The Helix is an area of Falkirk that links 16 communities by a network of canals and includes a large area of urban parkland that plays host to a lagoon, lots of pathways, and several children’s play areas. The entire area covers an impressive 860 acres of land and contains over 17 miles of cycleways and footpaths. You can find out more about The Kelpies with my 1-Day Drive From Edinburgh Itinerary. Completed in 2013, The Kelpies celebrate the lineage of the heavy horses that towed barges up and down Scottish canals for much of the 19th century. 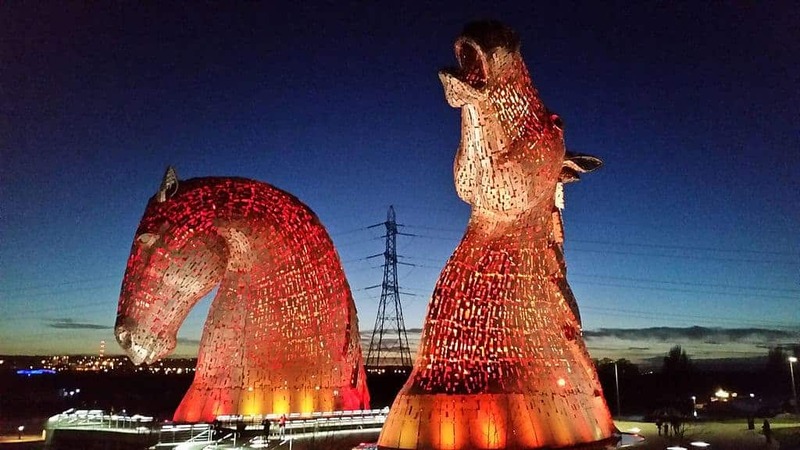 In ancient Scottish mythology, kelpies are sea horses which have the strength and stamina of ten normal horses, and it’s this quality which prompted artist Andy Scott to create them to represent the power and endurance of Scotland’s waterways. Prior to the creation of the sculptures that you can see at The Helix today the artist created miniature three-metre high versions in his studio so that any design flaws could be spotted before work started on the ‘real’ artworks. You can see two of these mini sculptures at The Kelpies sister site at The Falkirk Wheel. From Glasgow – take the M80 towards Stirling, exit at Junction 8 for M876 and join M9, exit at Junction 6 for Falkirk/Grangemouth and then follow the brown tourism signs to ‘Helix park and Kelpies’. *Two free children per one paying adult. Within the Helix the first car park is free of charge. Charges apply in the second car park, which is situated closer to the Kelpies. The charging period operates from April to October inclusive: 10am – 8pm. From 23rd October to Thursday 29th March there is no charge for this car park. 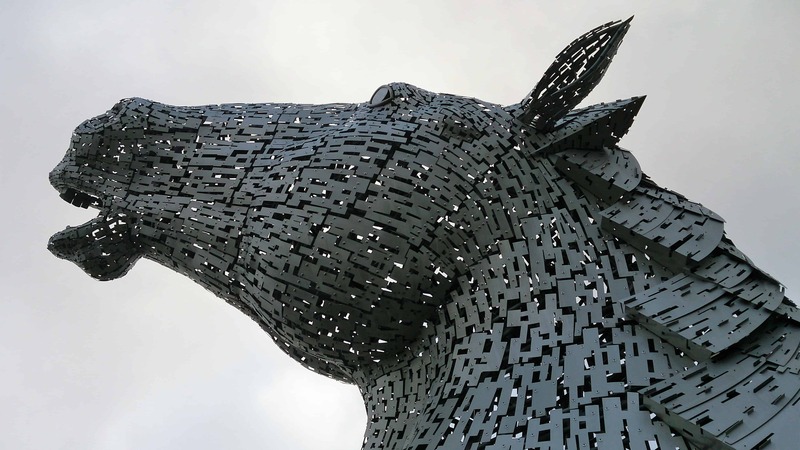 PLEASE NOTE: The Kelpies car park is closed between 8pm and 8am from October through to March (inclusive). The first car park will remain open for visitors at all times. The distance from the first car park to The kelpies is 0.8km.